Voicemail allows you to decide which messages you need to listen and keep on your device. 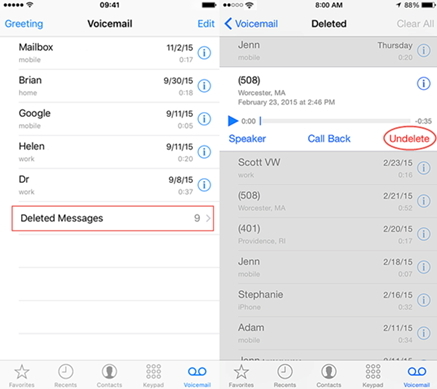 But, there are some users, who accidentally delete the voicemail on their iPhone. Some users also complain that they lost important voicemail when they upgrade the device’s iOS version or due to a formatting error, virus attack or other reasons. The issue of data deletion is not rare and many users face this problem. They immediately enter “recover permanently deleted voicemail iPhone” in search engines for finding solutions. In this article, we will show you different methods of retrieving the permanently deleted voicemail. Apple allows you to back up the entire data of your iPhone using iTunes. So you can recover the permanently deleted voicemail by restoring the iTunes backup to your iPhone. The entire data including the saved voicemail will get recovered. Follow the steps below. Step 1. Open iTunes on your computer and connect your iPhone using the USB cable. Step 2. Complete the steps that are shown on your computer screen and then select your device. Step 3. 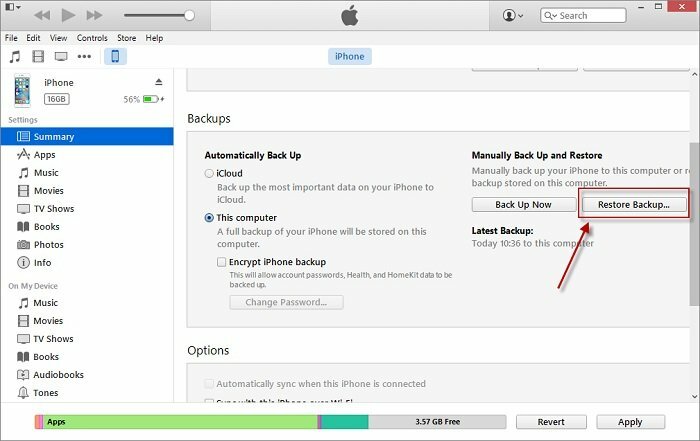 Click on “Restore Backup” and select the most appropriate backup of your device after checking its date and time. Step 4. When you click “Restore”, the restore process will begin immediately. Once it is finished, the entire data including the deleted voicemail will get restored to your iPhone. Please make a backup of your current data, because the full backup restore will replace all your current data. If you have enabled iCloud in your iPhone, the data will automatically get backed up to cloud whenever your device is connected to a Wi-Fi network. You can then restore the backup to your iPhone when you need. Follow the steps below to restore the backup to your iPhone. Step 1. Go to Settings of your iPhone -> Apps and Data screen and tap “Restore from iCloud backup”. Step 3. 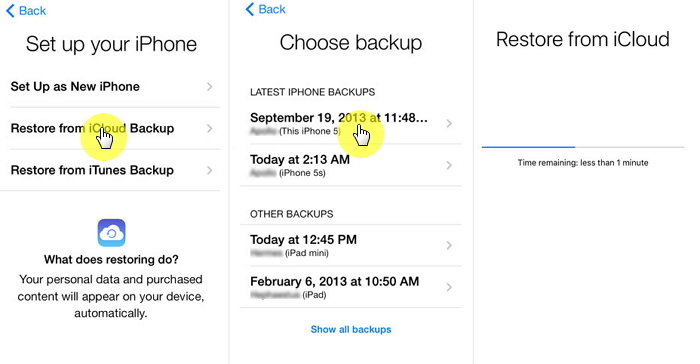 Select the latest iCloud backup of your device after checking the date and time. The restoring of data will begin immediately. Step 4. If asked, enter the Apple ID and password again to restore the apps and purchases. Step 5. Once the recovery process is complete, the entire iCloud data will be restored to your iPhone. You can now check the recovered voicemail in your iPhone. Please note that you need to erase all content and settings before restoring the backup. If you have recently deleted the voicemail, you can easily recover using simple steps below. Step 1. Open Phone app-> Voicemail -> Deleted Messages. Step 2. All the deleted voicemail will be displayed. Choose the ones that you want to recover and tap “Undelete”. This method will work only if the voicemail were deleted a few days ago. 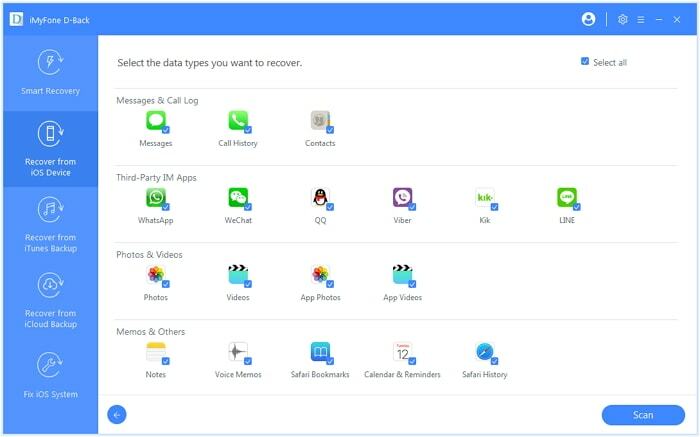 Apart from voicemail, the users may also lose other types of data from iPhone. In such a case, they can use a third-party data recovery tool for retrieving the lost or deleted data. iMyFone D-Back is one such tool that has already helped millions of users. With iMyFone D-Back, you can recover data from any model of iPhone running on even the latest iOS version. It allows you to retrieve the data regardless of how you lost it. It does not support to recover voicemail for now, but it will be supported soon. View and recover data you need from iTunes or iCloud without having to restore the whole backup. You don’t have to worry anymore even if there is no backup available to recover the data. iMyFone D-Back will securely recover the permanently deleted data from iPhone without any backup. Follow the steps below for recovering the lost or deleted data. Step 1. Open iMyFone D-Back data recovery tool and click on “Recover from iOS Device”. Click “Start”. Step 2. Connect your iPhone to computer. Your device will automatically get detected. Then click “Next”. Step 3. All file types will be displayed. Select the ones you need to recover from various options shown and click “Scan”. Step 4. Once the scan is over, the files that can be recovered will be displayed. Select all the files you need to recover and then click “Recover”. You need to choose a folder or create a new folder to save the files recovered. Once you choose, recovery will begin and you just need to wait for a while. iMyFone D-Back will easily recover the data by accessing the SQLite database of your device. You can also selectively recover from the iTunes and iCloud backup using iMyFone D-Back without restoring. Many users have sent the feedback to us and here is one of them. If you are still searching on how to recover permanently deleted voicemail iPhone, you need to view all the methods given above carefully. After checking all the methods, you can choose the one you trust to help you. If you have any other query regarding the above methods, you can leave your comments below.